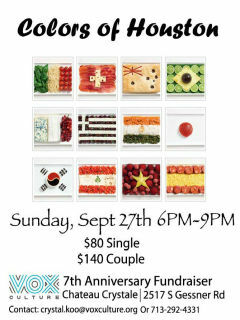 Vox Culture will be hosting its 7th Anniversary Fundraiser, Colors of Houston. The organization will continue its tradition of focusing on relevant topics in Houston. The previous fundraiser, Journey’s Collide, celebrated Houston’s immigrant community. This year Vox Culture will celebrate Houston’s diverse and colorful population. At a time when racism and prejudice continue to make our national headlines, there is no better time to elevate our common humanity and promote unity.